Your Diagnosis will pull in from the Initials Assessment tab of the case. Behavior Definitions: Generally refers to the behaviors you wish to target for treatment. 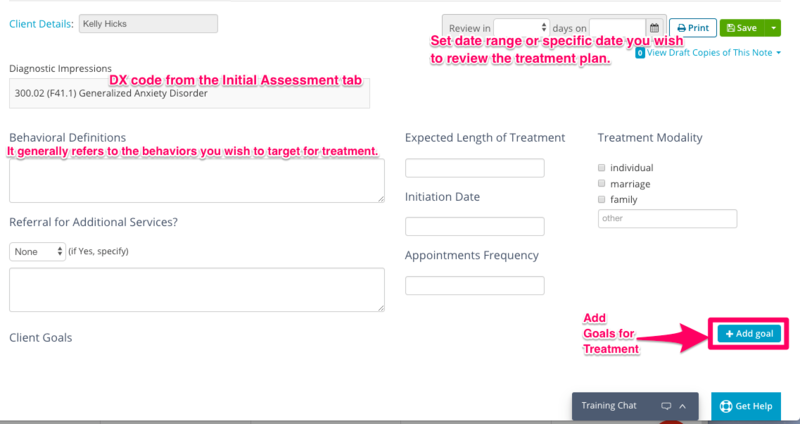 You can add multiple goals and objectives, along with goal status to your treatment plan notes. Once you sign a treatment plan changes or progress cannot be made on that treatment plan entry. However, you'll see that when you add a new treatment plan the goals and objectives you entered on the previous treatment plan pull in for you to make changes/progress. This is so you can have a running log history of how progress has been made over time.